This post comes (well) after the shop update related to these pieces. And some of these words and photos were originally shared elsewhere. But I wanted to place them here in this cozy corner, regardless. For posterity and what not. Perhaps my favorite of the bunch were the earrings. 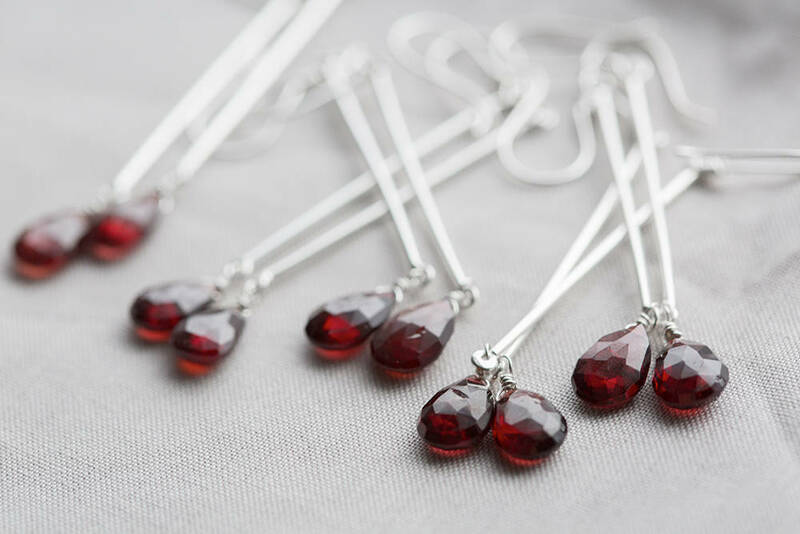 Deep red garnets swinging low on lengths of sterling silver, ripe for the plucking. Just long enough for a constant, subtle sway and comforting brush against the neck. In January, I knew I wanted to create a sweet little collection for Valentine’s Day. People have varying opinions on the merit of a Hallmark holiday, and I understand most sides of the argument. But I will never begrudge a reminder to write a few words of love to my fella and pick up a surprise copy of Blade Runner 2049, so that we can watch it again. And again. And again. I came to realize as I moved gemstones around the pages of my sketchbook that I wanted to craft this Valentine’s collection a bit differently. 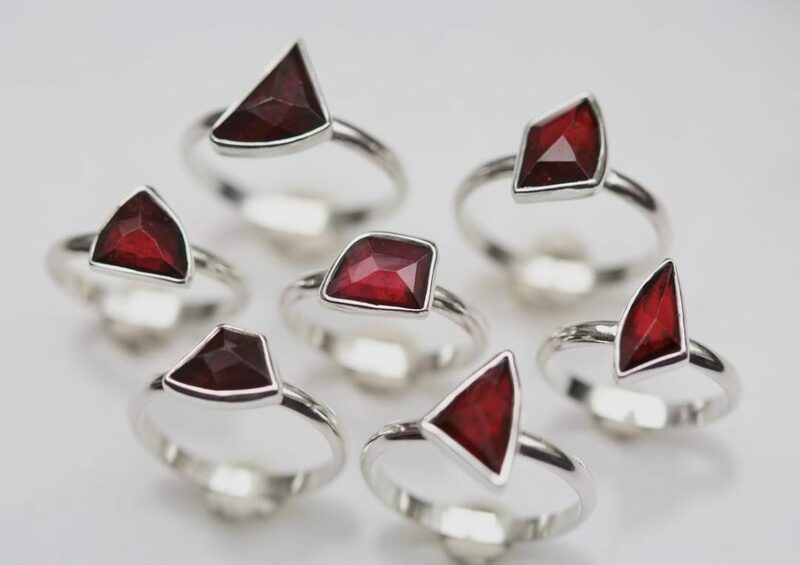 In keeping with the sentiment in that sonnet, the garnets I chose for the rings and earrings are each unique and wholly natural. I didn’t want to use stones that were too eye-clear, symmetrical, or free of imperfection, because love is not so either. 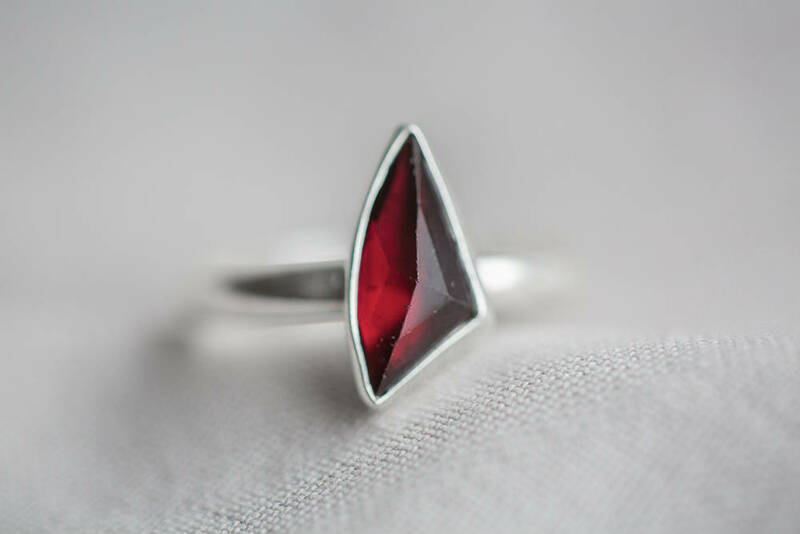 Love is unique in all instances, each with its own beauty and hardship, therefore I used stones that reflected that. 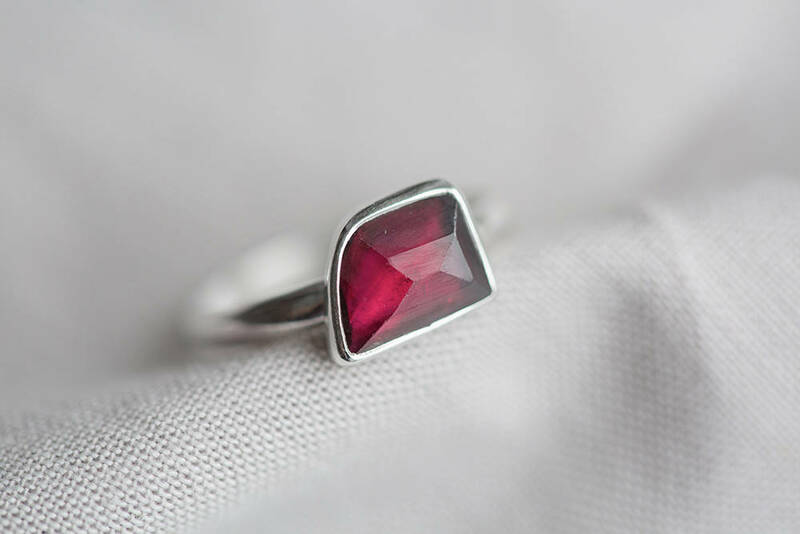 And so I shied away from using my small collection of nearly flawless garnet gemstones, somewhat artificial looking in their perfection. 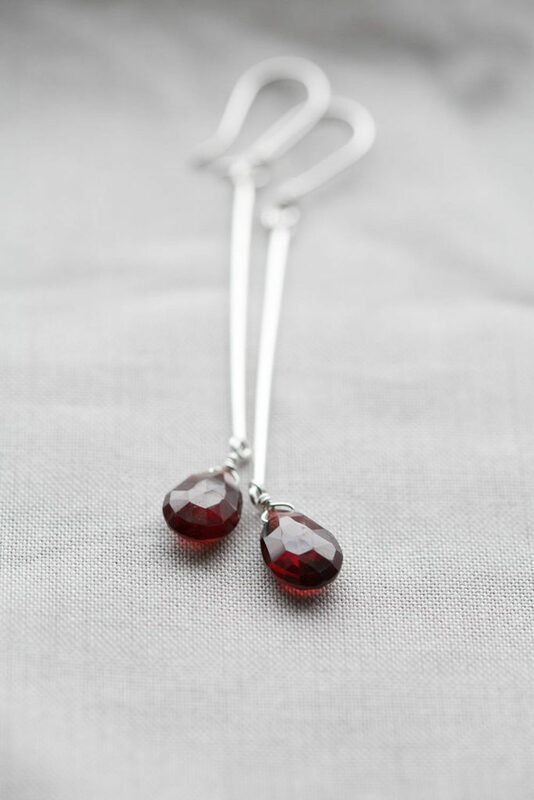 The garnets I chose for this Valentines collection are a bit rough and raw and real. 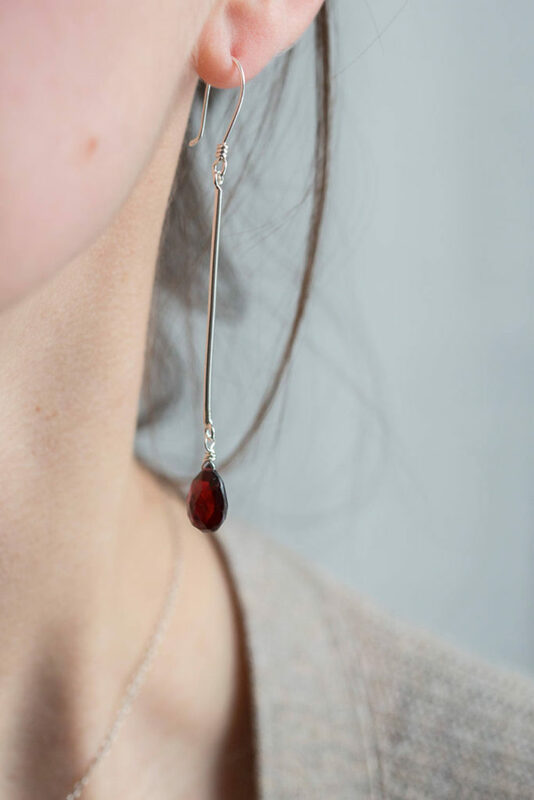 They feature feathery inclusions, asymmetrical faceting and shapes, and natural pitting and chips on the surfaces, because like love should, these pieces embrace uniqueness, natural flaws, and sincerity of intention. And I have already kept a pair of earrings and a ring to remind me of this. The others were placed on my shop shelves to await those perfectly imperfect people to come along.